The Bolt EV is not GM’s first pure electric car. The company has been experimenting with electric vehicles for decades, stuffing batteries into Corvairs in the mid-1960s and developing the fiendishly complex EV-1 in the 1990s. You can buy an all-electric version of the Spark city car from your friendly local Chevy dealer right now. 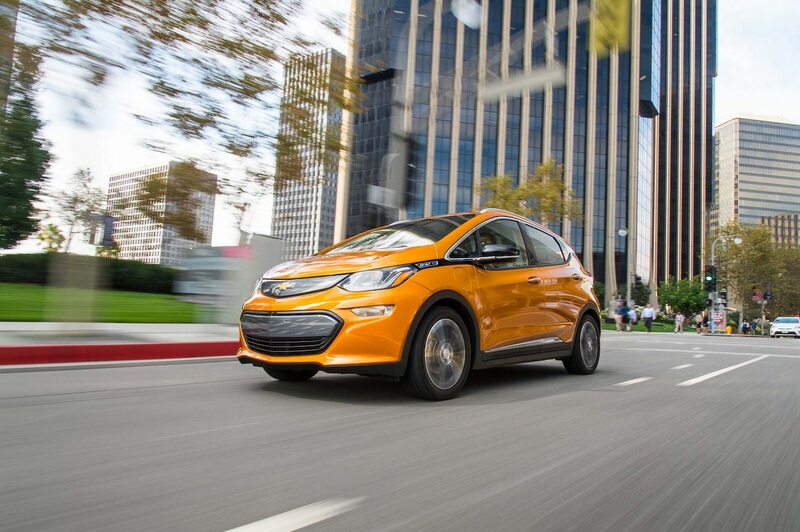 But the Bolt EV is the first conceived from the get-go by GM to be a viable, affordable mass-market electric vehicle. And it’s a game changer. Perhaps the most impressive thing about the Bolt EV is there are no caveats, no ”… for an electric car” qualifiers needed in any discussion. It is, simply, a world-class small car, and that’s before you factor in the benefits inherent in the smoothness, silence, and instant-on torque provided by the electric motor. The ride is firm and sporty, but transmitted road noise is very well damped. The steering has slightly artificial weighting, but brake feel is very natural, and once you learn to use the higher regenerative braking modes (place the shifter into L, or pull the paddle on the left-hand side of the steering wheel) you can pretty much drive all the time without touching the friction brakes at all. There may be some who see the selection of an electric vehicle as Motor Trend‘s Car of the Year—for only the second time in the award’s seven decades—as highly controversial. But to do so would be to suggest the Chevrolet Bolt EV is nothing more than an automotive oddity, a publicity stunt, or a technological dead-end of limited use or value. Nothing could be further from the truth. 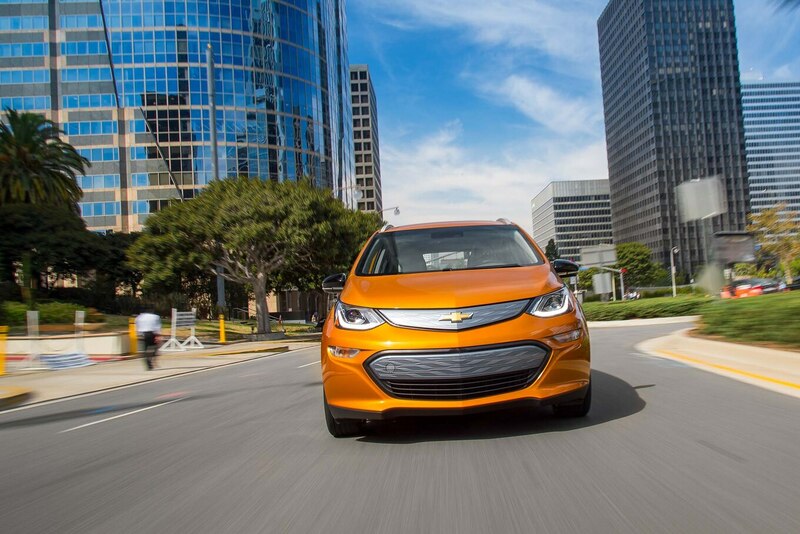 Here’s how the Chevrolet Bolt EV stacks up against the award’s six key criteria. The Bolt EV is the sort of tall hatchback you usually see from European and Asian manufacturers. It’s a globally relevant vehicle format that has the potential to deliver excellent interior room for up to five passengers along with a high degree of load-carrying functionality in a relatively compact footprint. And in the Bolt EV, Chevy has delivered. This is one of the best-packaged small cars in the world. The Bolt EV rides on a wheelbase 3.9 inches shorter than that of a Toyota Prius, but it’s a massive 14.7 inches shorter bumper to bumper. Despite those packaging constraints, “The space inside is stellar,” said our gangly 6-foot-tall associate editor, Christian Seabaugh, who noted the ample legroom and headroom up front and a rear seat that is “enormously comfortable and roomy for a vehicle of this size.” Indeed, our tallest testers had no problem sitting in the rear of the Bolt EV even with front seat racked rearward to accommodate a 6-foot-plus driver. The 60-kW-hr battery pack, co-developed with and assembled by LG Chem, holds more than triple the energy of the pack in the Chevy Spark EV—but weighs little more than twice as much. 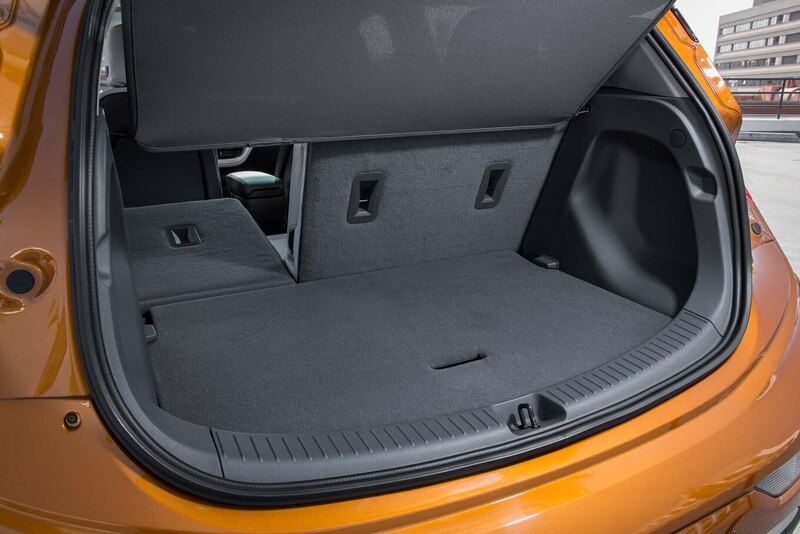 Mounted under the floor and rear seat, the battery pack is also used as a structural element, contributing 25 percent toward the overall torsional stiffness of the car. The battery is expected to last the life of the Bolt EV, and it’s covered by an eight-year/100,000-mile warranty. That sound? It’s the sound of the automotive world shifting on its axis. The Bolt EV’s electric motor is mounted between the front wheels and is remarkably compact. 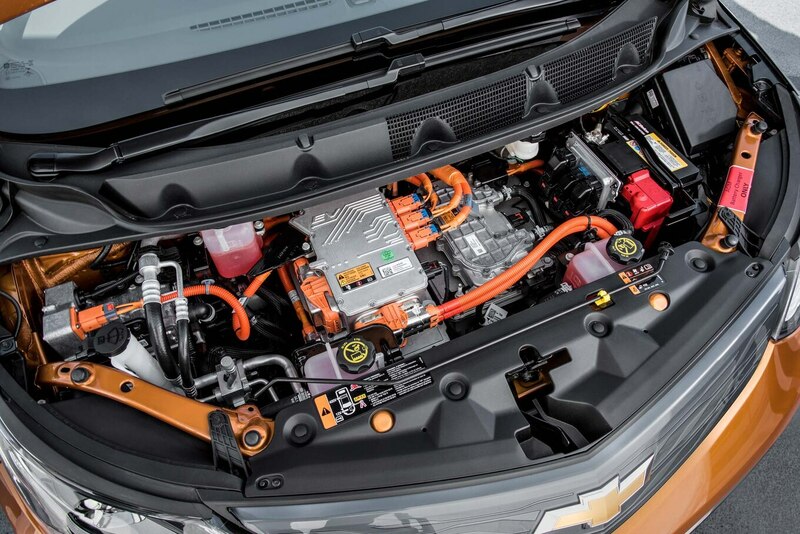 The motor design draws on GM’s long experience with electric powertrains and, like the B motor in the latest generation of the Volt plug-in hybrid, features carefully arrayed magnets made from a rare earth metal called dysprosium. 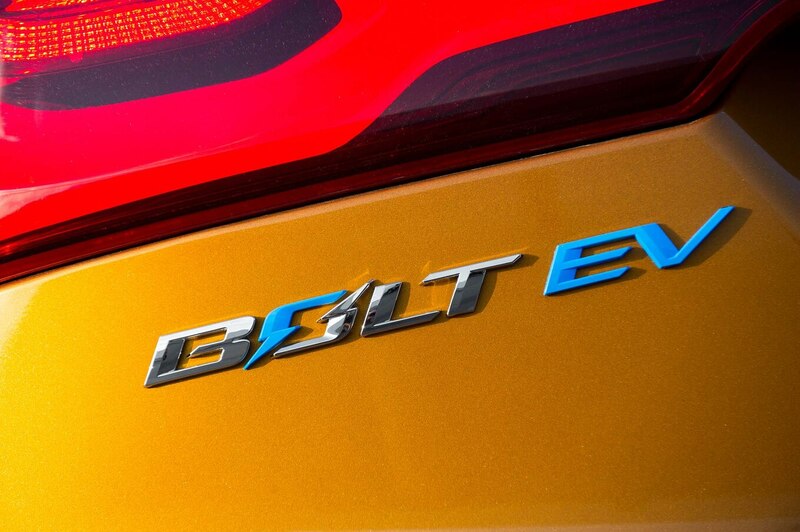 The Bolt EV develops 200 hp and 266 lb-ft of torque, and its power density is 56 percent greater than the motor in its weaker predecessor Spark EV. As the new motor also spins much faster than that of the Spark EV—to 8,810 rpm versus 4,500 rpm—the single-speed transmission runs a much shorter ratio. That helps propel the 3,548-pound Bolt EV from 0 to 60 mph in 6.3 seconds and cover the standing quarter mile in 14.9 seconds at a speed-limited 93.1 mph (149.8 km/h). The Bolt EV was comfortably the quickest of all the small cars tested in this year’s COTY field—apart from the boy-racer Focus RS, of course—quicker, even, than the Fiat 124 Spider. The engineering excellence isn’t confined to all the electric powertrain hardware and software, either. 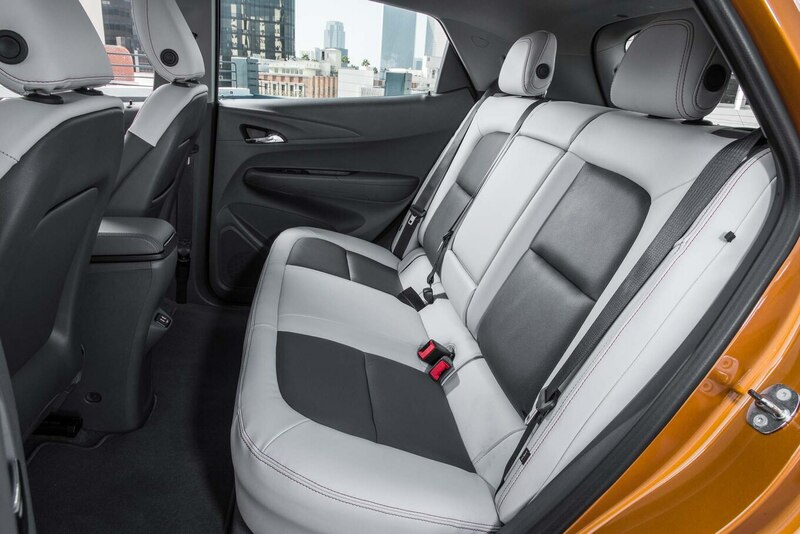 The front seats feature an industry-first ultra-slim design that uses a metal framework and a flexible plastic shell lined with a very thin layer of foam. Up to seven devices can connect to the available 4G LTE onboard Wi-Fi hot spot, and up to 10 phones can connect to the car, with the driver’s preferences for nav, climate, and infotainment associated with the phone. Drive data can be recorded and shared, so Bolt EV owners can compare miles/kW-hr, energy regeneration, and climate efficiency. 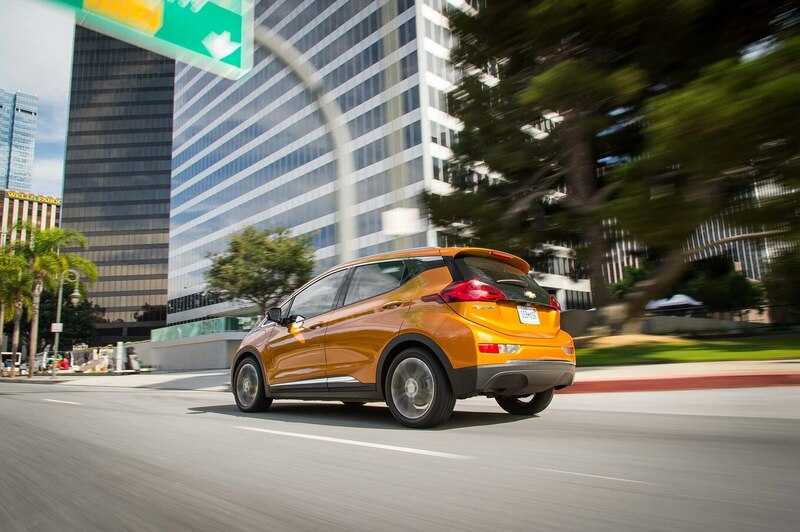 In our testing, the Bolt EV easily makes its EPA-certified range of 238 miles (383 km) in normal driving conditions. Of course, as with a gasoline-powered car, your mileage may vary—flat-foot the Bolt EV everywhere, and you’re not going to travel as far before you need to put more energy in the “tank.” More important, our testing suggests it’s more efficient than the Tesla Model S 60, using about 14 percent fewer kW-hrs of energy to complete our Real MPG test route. One element in EV operating efficiency is, of course, the time it takes to recharge the battery. Unlike Tesla, GM does not have banks of special bespoke Superchargers for ultra-fast charging. But using a typical Level 3 charger, our experience supports GM’s claims that the Bolt EV can be given an extra 90 miles (144.8 km) of range in 30 minutes, 160 miles (257.5 km) worth in 60 minutes, and a full charge in two hours. That’s not too far off Tesla’s Supercharger capability. 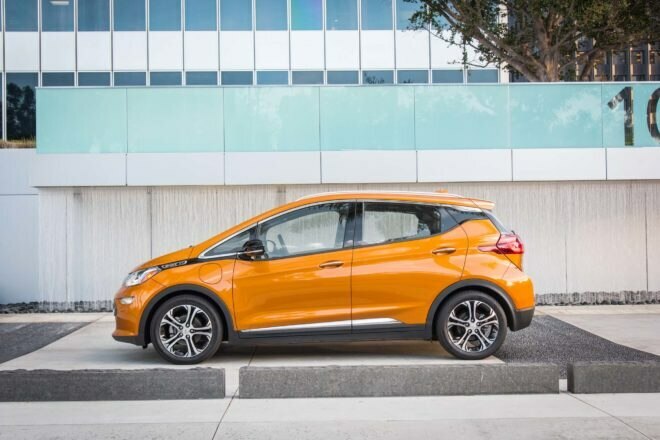 The Bolt EV has yet to be independently tested by NHTSA or IIHS, but GM says it has engineered the basic structure of the car to deal with the forces of the new small-overlap crash test despite its small overhangs, using an upper cradle and a cross-car beam to stabilize the front end. Five cross-car beams and a structural steel tray not only add to the overall structural integrity of the Bolt EV but also protect the battery pack in the NHTSA NCAP side-impact pole test. The Bolt EV comes standard with a lane departure warning system that despite some self-steering capability is really only to assist drivers rather than to take over the job of steering for them. 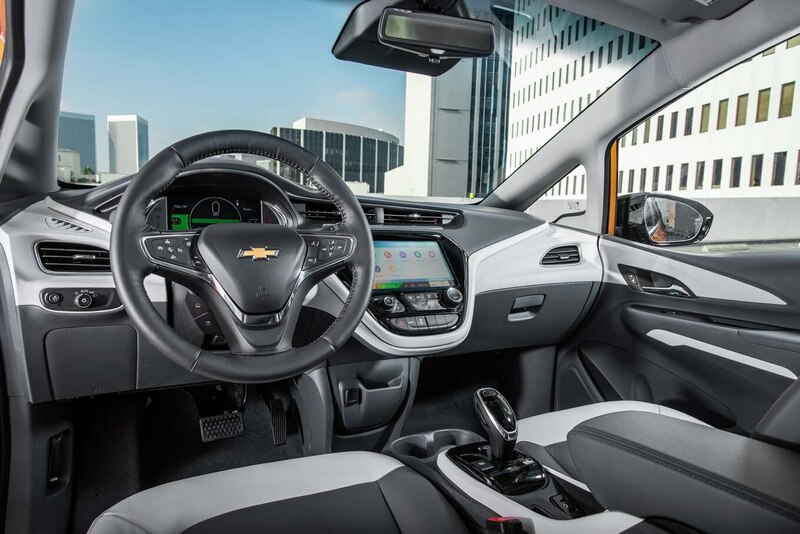 Available driver aids include forward collision alert, cross-traffic alert, blind-spot alert, and pedestrian braking—all off-the-shelf GM technologies available on other GM models. On the face of it, $37,495 USD seems a lot of money for a compact hatchback, but the math deserves some perspective. 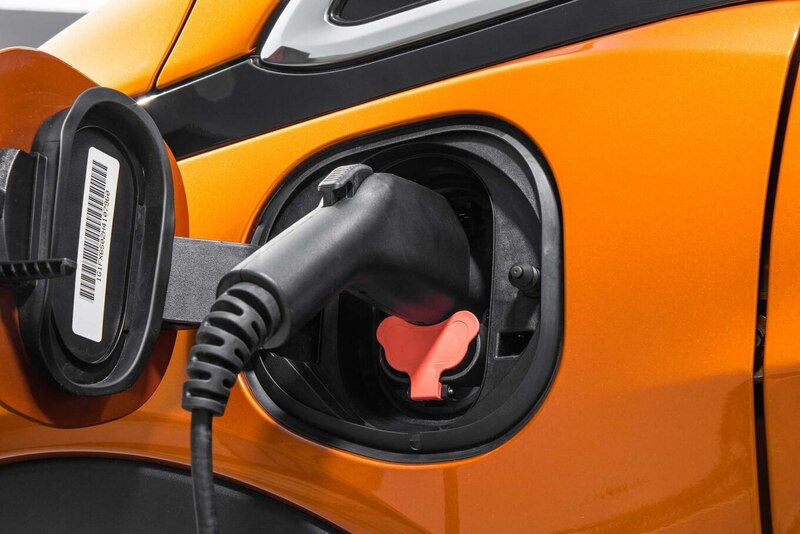 The federal EV tax credit of $7,500 USD gets the price down to less than $30,000 USD, which is outstanding value in terms of the current state of electric vehicle technology. And other state EV rebates may knock the price down even further. Only a Tesla offers superior range and performance, and the cheapest Model S 60 costs $67,200 USD (before rebates). Sure, the Tesla is quicker and faster, but it only has an EPA-certified range of 210 miles (337.7 km). If you want to do better than the Bolt EV’s 238-mile range, you’ll need to spend $74,500 USD (before rebates) for the Model S 75. Of course, the Tesla Model 3 is slated to be priced around the same as the Bolt EV and scheduled to start trickling off assembly lines in late 2017. But Tesla has been evasive about transaction prices for a fully equipped vehicle. The Bolt may still maintain its edge here. What’s more significant, however, is the Bolt EV makes a solid value case even against conventional small cars. In terms of its performance levels, the Bolt EV is not that far off a PDK-equipped Golf GTI, being only four-tenths of a second slower to 60 mph and over the quarter mile. And after the rebate is taken into consideration, it’s basically the same price. The Bolt EV is also a car for a world that’s becoming increasingly urbanized and that needs to reduce its dependency on fossil fuels—partly because there’s only so much of the planet we can frack and partly because air quality in our cities is again becoming a significant health issue. But this isn’t some earnest, po-faced science project we should endure to save the planet. The Bolt EV is fast, it’s fun, and it’s genuinely entertaining to drive. It makes you smile. American engineering ingenuity and manufacturing capability kick-started automobility for the masses in the early 20th century. Now, a little more than a century later, America is about to do it all over again. 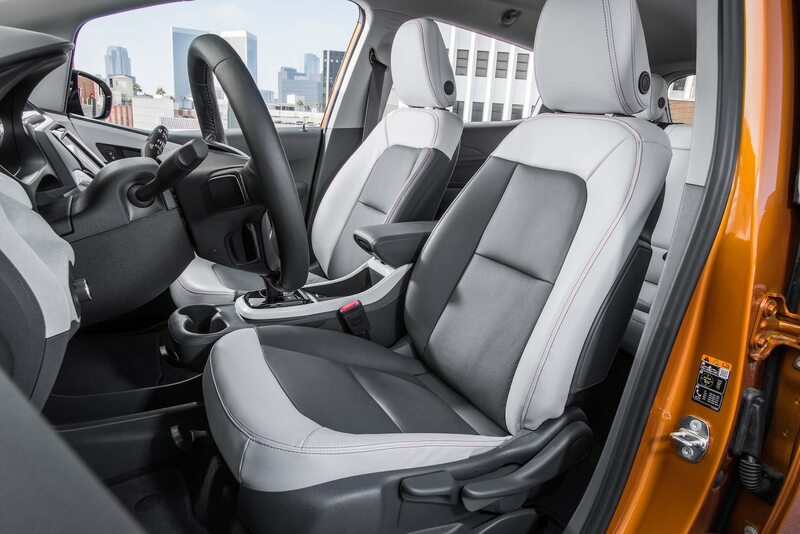 The practical, affordable, fun-to-drive Chevrolet Bolt EV has made electric-powered transport for the masses a reality. The 2017 Motor Trend Car of the Year is the car of tomorrow, today.